We’ve recently added two powerful tools to the U.S. Web Design Standards development workflow that allow us to preview, test, and publish the Standards code more quickly and easily. Fractal is a powerful and flexible framework for building interactive component libraries. It’s similar to Jekyll (which we use to publish the Standards site) in one key respect: It operates primarily on simple file naming conventions. Organize your files in a specific way, using the content and data formats it understands, and it will generate a web site automatically. It’s open source, so we didn’t have to pay for it (which can be time-consuming and difficult to authorize in government), and we can easily modify it to suit our needs. It’s easy to use. Fractal supports some of the same, user-friendly file formats as Jekyll, such as Markdown and YAML; and it comes with a handy development server that reloads the site automatically whenever you change a file. 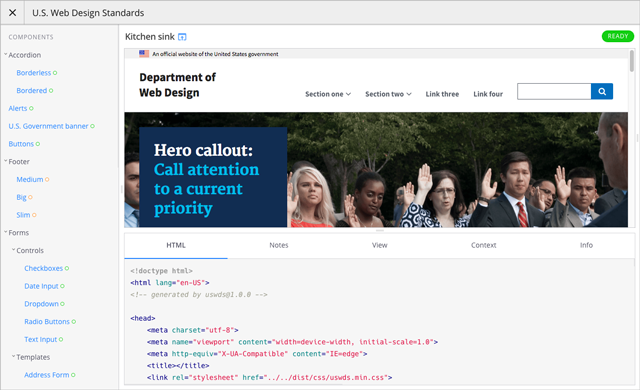 It generates standalone HTML previews of each component, which we can use for accessibility, cross-browser, performance, and visual regression testing. Fractal offers a customizable theme engine, so we can make it look and feel like the Standards. Fractal’s component-oriented architecture nudged us to consider how each of our own components really work: What are their moving parts, and how do their “variants” (for instance, our basic and extended headers) differ from one another? The process of adapting our components to Fractal produced a basic interface inventory, which shows us exactly where we are right now, and the interactive previews give us the confidence to make bigger changes because we can immediately see their impacts on various aspects of the Standards. Now each of us has a powerful development, testing, and documentation tool at our fingertips, which we can use to test every aspect of the Standards code without any of the customizations we’ve made on the Standards site. Fractal even comes with a handy resizable preview window we can use to test the responsiveness of each component or page template without having to resize our entire browser window. But wait, there’s more! Fractal is an invaluable tool for those of us developing the Standards on our own computers, but what if we put it… on the cloud? That’s where Federalist comes in. In a nutshell, Federalist is GitHub Pages for government: a platform that automatically builds and publishes static sites whenever we push commits to our GitHub repository. Unlike GitHub Pages, though, Federalist isn’t limited to publishing just static files and Jekyll sites: We can use the same Node.js tools we use to develop the Standards to publish our Fractal component library as a static site on Federalist. One of Federalist’s most useful features is its ability to publish “branch previews”. Whenever we push commits to a branch on GitHub, Federalist builds a new version of the site and publishes it at a predictable URL. For instance, you can see the current state of our develop branch preview, or you can kick the tires of our forthcoming version 1.1.0 release on the release-1.1.0-pre branch. Federalist hosts other websites across government and is open for business. If you’re interested in using it to host and preview your own federal static sites, please get in touch with that team! We can even link directly to individual components, and their standalone previews. These links help us provide more targeted feedback and more quickly address any issues that arise. We’re working on a reorganization of the Standards site that will incorporate Fractal’s standalone component previews and code samples so we don’t have to maintain them in two different places. We’re also exploring the possibility of enabling live editing capabilities in Fractal so that we can more quickly create and share test cases for each of our components. We’ve also got more work to do on fully porting our old component templates over to Fractal and better organizing our components, variants, page templates, and related documentation. If you have a suggestion, see something amiss, or just want to say hi, feel free to file an issue on GitHub, email our mailing list, or join our public Slack channel.This post was originally published on the 18F blog.